Do I have a right to see what is on my credit report? I can answer this question in one word: ABSOLUTELY! The information on your credit report is about YOU, so you definitely have the right to know what’s there. Why should you care what some random report says about you? Well, for one thing, the information on there could be wrong. For another thing, whether you get approved for a loan, an apartment lease, or even a job, what you pay in rent and interest rates could depend on what that report says—so you better know what’s on there! Let’s back up and get to the basics. A credit report is a detailed report of a person’s credit history. 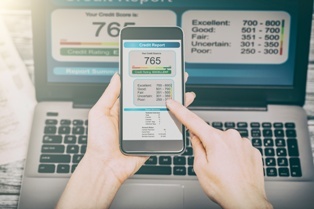 Actually, you don’t have a single credit report—you have three—one with each of the three credit reporting agencies (CRAs)—TransUnion, Experian, and Equifax (yes, THAT Equifax). While the reports should theoretically be the same if all the information they have is accurate, a mistake can appear on any one of the three, so you should check each one every year. Under the Fair Credit Reporting Act, you have the right to a FREE credit report from each of the CRAs every 12 months. Now, there are companies who will be happy to sell you a report, or claim they are giving you a free report, but then charge you an annual fee. Avoid these companies like the plague! The only authorized place to request your free credit report is this website: www.annualcreditrepor.com. What Are You Looking For In Your Credit Report? When you get your report, look at every entry. If anything looks wrong—there’s a credit card listed that you don’t have or a debt you already paid off—you can dispute it with the CRA and they are required by law to investigate. In most cases, they have 30 days to correct or delete the information. If they don’t, you may be able to sue them for damages. That’s where I come in. If you are having trouble getting your credit report corrected, contact me to see if I can help. I will take a look at your situation and if it looks like you have cause to sue, I will help you take the necessary action. But don’t wait too long—check those reports and call me if there’s a problem!